In his recent work, Guy Standing has identified a new class which has emerged from neo-liberal restructuring with, he argues, the revolutionary potential to change the world: the precariat. This, according to Standing, is ‘a class-in-the-making, internally divided into angry and bitter factions’ consisting of ‘a multitude of insecure people, living bits-and-pieces lives, in and out of short-term jobs, without a narrative of occupational development, including millions of frustrated educated youth…, millions of women abused in oppressive labour, growing numbers of criminalised tagged for life, millions being categorised as "disabled" and migrants in their hundreds of millions around the world. They are denizens; they have a more restricted range of social, cultural, political and economic rights than citizens around them’. This present book explores the nature, shape and context of precariat, evaluating the internal consistency and applications of the concept. 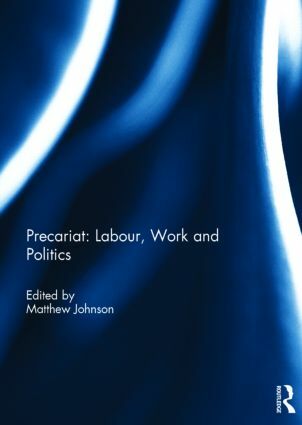 Demonstrating the sheer breadth and depth of application, the chapters cover a wide-range of topics, from the relationships between precariat and authoritarianism, multitude (another concept to achieve popular consciousness), and place as well as the nature of precarious identities and subjectivities among those working in immaterial labour. The book concludes with a reply by Standing to reviews of Precariat. Matthew Johnson is a Lecturer and British Academy Postdoctoral Fellow in Politics, Philosophy and Religion at the University of Lancaster. He is interested in the evaluation of culture and the effect of forms of intervention on wellbeing. He has authored Evaluting Culture (Palgrave) and edited The Legacy of Marxism (Continuum).